· Forty-eight percent of all listeners are under the age of 35. Members of that cohort listen to an average of 15 books per year. · Seventy-seven percent of frequent listeners claim that audiobooks have helped them finish more books. You can listen to audiobooks on phones, iPods, computers, and in the car. While listening, you can do housework, exercise, bake, and complete craft projects and menial tasks such as folding laundry. You may even find yourself working faster and getting more accomplished. A good narrator will do voices and bring the story to life. Listening to a well-modulated voice is a soothing way to destress at the end of a workday. You can also share the experience with family and friends and then have lively discussions about the book. This comes in handy during long road trips. Studies show that 85 percent of what you learn, you learn by listening. Audiobooks help when faced with “dry” content that you need to absorb quickly. The faster pace on audiobooks allows slow readers to finish the book faster. Some apps, such as OneClickDigital, have speed settings that enable you to increase the pace to 2x and finish the book in half the time. 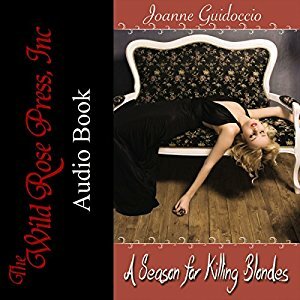 The audiobook for A Season for Killing Blondes is now available on Audible, Amazon, and iTunes. Enter to win 5 audiobook download codes (US/UK) for A Season for Killing Blondes. Audiobooks are great while doing housework! Good to see you here, Janet. I wouldn't be too surprised to learn that the homes of audiobook readers are spotless. Thank you for promoting audiobooks! I’m getting more housework done and the miles melt away during long road trips. I’m listening to about 60 audiobooks a year. I always have one going along with an eBook. Looking forward to listening to your book. I listen to audio books while I'm walking. Since I try to walk at least 5 days a week, they are a great walking companion. Congrats on your new audiobook release, Joanne! Audiobooks are great. I'd love to see them insert special effects like slamming doors and gunshots, it would add to the experience. Hi Jacquie, I'd also love those special effects. But I'd worry about sensitive listeners who may startle at loud noises. I really enjoyed audio books when I worked at the library. I always had one going as I commuted to and from work. What was nice was I could get several discs ahead then let my husband start listening. It was nice to be able to discuss books. He doesn't have much time to read, so this commute time worked perfectly. I am still using books on CD and not tried the audio books on my phone or reader. Neither of us commute any longer, but we do listen to books when we travel. Good narrators make the books come alive. I will be starting infusion treatments in the near future. I plan on digging out my Walkman CD player so I can listen to books while undergoing the long treatments. A good distraction plus I get to "read" more books. Hi Patricia, What a lovely "couple" activity. Best of luck with the infusion treatments. Stay strong!